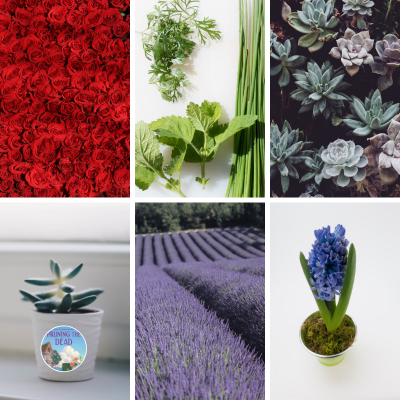 This week we have a review of Julia Henry’s latest gardening mystery, plus a Valentine’s Day guest post about plants instead of flowers as gifts by Julia. Details at the end of this post on how to enter to win a copy of Pruning the Dead. There is also a link to purchase it Amazon, and an indie bookstore where a portion of the sale goes to help support KRL. Lilly Jayne is known for her fabulous gardens. It’s a matter of knowing the plants, placing art work in between, and creating an overall layout that brings it all together. Lilly’s been out of contact with many of her friends for a while. First, it was her husband Alan’s illness and then the grief over his death. A garden party with a hundred people invited, plus ones added, and gate crashers besides, has the garden full of laughter, chatter, and some snarking. Merilee, Pete’s third wife, has no class. She uses people and is blatant about it. The high point of Marilee’s afternoon was to push another guest into the koi pond. Lilly puts up with Merilee’s bad behavior up to a point because, fresh out of college, Lilly had married Pete herself. Lilly admits she’s been in a fog for some time but is now starting to notice things like an overgrown park, an overzealous town clerk who issues fines for the tiniest infractions, and a new neighbor next door. It’s time for her to get involved again. On the first day of park cleanup, Merilee is found dead in a pile of mulch, clippers stabbed into her chest. Pete admits she was always hard to live with but lately had gotten much worse—or let her true feelings out, without a filter. He’s pretty much the only one to mourn her death. Plenty of people disliked her, quite a few hated her, many were afraid, and one had the gumption to do something about it. Lilly knows they have to find out who and why. Lilly is about sixty-years-old. She’s active, has Delia (Alan’s former assistant) living with her to help when needed, and has enough money to help those in need, anonymously. Warm, thoughtful, and kind, she’s the sort of friend everyone should have. Delia is a master of research. Added to Lilly’s skill at asking questions, it can lead to a solution for most any problem, including murder. I had narrowed down the suspect list to two likely murderers but didn’t know who it was until the reveal. As much as I like Lilly, the other characters are equally interesting. Varied ages, men and women, single and married, they get along well—until someone crosses the line, that is. A thoroughly enjoyable tale, I look forward to the next book. Find gardening tips from Lilly at the back of the book on composting, starting planets, repealing mosquitos, marigolds, aphid control, deer repellant, lighten up planters, caring for ornamental grasses, and reenergizing perennials. Henry also writes the Theater Cop series, the second in the series launching in April, titled With a Kiss, under the pen name of J.A. Hennrikus. In her Julianne Holmes persona, she writes the Clock Shop mysteries (3). As we move towards Valentine’s Day, the rose industry is gearing up for the dozens and dozens that will be sent to beloveds to celebrate. But what about folks who don’t have a Valentine? Or who don’t like roses? Does that mean the holiday doesn’t have a plant or flower idea for them? The longer answer is that Valentine’s Day offers a great opportunity to think outside the rose box, and explore the world of plants. Though some folks want the traditional, if you know someone who might want another sort of gift, here are a few ideas. By the way, these could also be used as “I’m thinking of you” gifts all year long. Succulents are very popular right now. I can remember making terrariums as a kid, and I see that’s coming back, too. These plants can be arranged in a planter, or given individually in a fabulous plot. They are low maintenance as well. Forcing bulbs isn’t too difficult, and can be a lovely way to give a flower gift. You can force all sorts of bulbs–tulips, hyacinths, paperwhites. You could even give a gift of all of the parts for your friend/partner who loves to garden and is getting antsy this time of year. Another wonderful green gift are fresh herbs. Many herbs can be grown inside in a winter garden, and make a great gift for the cook you love. Mint, chives, basil, oregano, parsley, thyme…they will all do well with a little TLC. Do be careful if you move them outside in the spring, especially of the mint. It can take over a garden, and should remain a container plant. Lavender is a lovely plant that can be used dozens of ways. The smell is soothing, and it can also be added to teas and cocktails. If your Valentine loves the smell, this is a great option. The winter months may be a resting period for the plant, but it can be brought outside in the spring and taken back in before the first frost. If you have a brown thumb, but still want to give the gift of plants, think about buying pots and painting them with your own messages or special flare. You can buy a flowering plant to put inside the pot, and your thoughtfulness still shines through. I love gardens, plants, flowers, and gardening gifts. I also love big bunches of carnations this time of year, since they last a long time and brighten up a room. Whatever the reason, or occasion, think about giving the gift of green this Valentine’s Day! To enter to win a copy of Pruning the Dead, simply email KRL at krlcontests@gmail[dot]com by replacing the [dot] with a period, and with the subject line “pruning,” or comment on this article. A winner will be chosen February 16, 2019. U.S. residents only. If entering via email please include your mailing address (so if you win we can get the book sent right out to you), and if via comment please include your email address. You can read our privacy statement here if you like. Check out other mystery articles, reviews, book giveaways & mystery short stories in our mystery section. And join our mystery Facebook group to keep up with everything mystery we post, and have a chance at some extra giveaways. Be sure to check out our new mystery podcast too with mystery short stories, and first chapters read by local actors. A new episode went up this week! 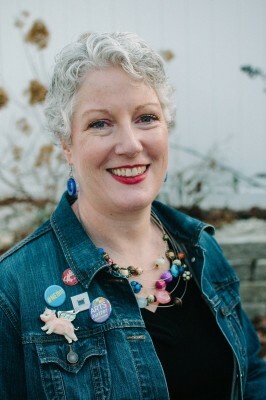 Julia Henry lives in Massachusetts and works in the performing arts. 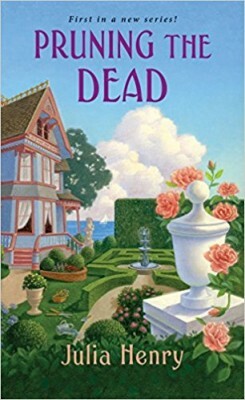 Her debut mystery in the Garden Squad series is Pruning the Dead. She writes three different mystery series under three different names, and can be found at JHAuthor.com @JHAuthors. I have been waiting for this new series! Thank you for the giveaway! Wonderful plant ideas, especially for those of us who have a brown (or black!) thumb. I also love the idea of Lilly getting involved again after her grieving period. Thank you for the giveaway! Ricky Nelson has his own ideas about Garden Parties! I have a number of succulents, and they seem to be doing quite well. I love mysteries with characters a little older!